Portable Rubber Sign Post Base made from recycled tires. 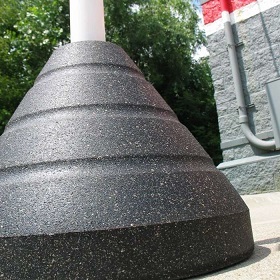 Attractive and durable with speckled-Black (Granite-look) cone-shape base. Measures 18-inch wide and 14-inch tall. Choose either round (2 3/8-inch) or square (1 3/4-inch) post insert. (Post sold separately). 72 lbs. Environmentally friendly "Green" product, which displaces five used tires from the landfill. Ideal for any portable sign location in parking lots anywhere, including parking garages, crosswalks, schools, shopping malls, grocery stores, plazas, universities, hospitals, airports.